Shirts With Random Triangles: The Poinsettia Bowl is an ex-bowl game. 2016 Poinsettia Bowl. Image via Sports Page Magazine. Adios to the Poinsettia Bowl. Plans to redevelop Qualcom Stadium into a smaller capacity stadium for soccer has forced the San Diego Bowl Game Association to drop the game in order to focus on the Holliday Bowl. The Poinsettia Bowl's demise is the latest in a string of dominoes that started to fall when the San Diego Chargers NFL franchise announced plans to relocate to Los Angeles. Mark Neville, executive director of the San Diego Bowl Game Association, explained the reason to shut down the Poinsettia Bowl. The San Diego Bowl Game Association is reportedly in talks with the San Diego Padres to move the Holliday Bowl to Petco Park. The Poinsettia Bowl was first held in 2005. 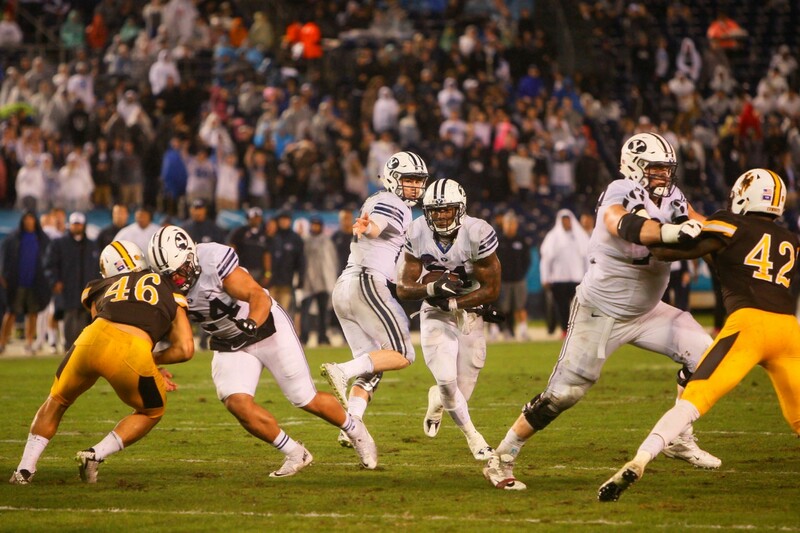 BYU defeated Wyoming in the 2016 and apparently final Poinsettia Bowl 24-21.